As fall approaches, I like to start deep cleaning the house for the holidays before decor comes out. 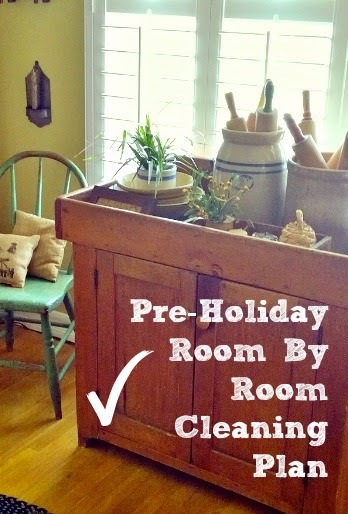 It's no fun decorating a dirty house and by Christmas you will be so happy that your house is clean for company. I will share what I do in each room and you can use it as a checklist or guide for your home customizing for your rooms. Maybe this will inspire you to spend a little extra time getting the house shiny and bright before we get all those holiday plans going. Start by clearing the room you are on of any items that do not belong in there. As I move a piece of furniture to clean behind that day I wipe it down and dust all nick knacks on it. Flip area rug over and vacuum the wood floor underneath and then vacuum the underside of the rug. **You could also touch up any chipped paint or marks on the wall. I love the Mr. Clean Magic Erasers for this job. Next, onto the dining room. See you there. Hi Elaine, Being in a new home, to us, it might be easy to overlook some areas-so I appreciate your list. Sounds like you've got it well covered, Elaine. I am in the process of doing the same thing. I don't like to decorate a room until I do this! I need to do is as soon as canning season is done. It reminds of my MIL cleaning routine. She was always moving furniture and cleaning behind it. I'm going to pin this list! I am so impressed with this early start. This year I am taking one room a week and really giving it a go through. Tomorrow it will be the living room. I do just about the same thing. It's so easy to miss something if you leave it completely up to brain-power! I'll be copying your list! Your home always looks so charming. I do a big spring cleaning that wears me out! I'll clean with you this fall and maybe spring won;t be so hard!